First to leaf out in spring, last to drop its crinkled leaves, and the golden fall color makes grown men cry when they walk by my house. 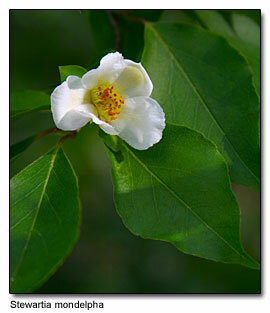 Incredible red bark, fantastic fall color and pretty white camellia flowers bloom well in deep shade. Choose carefully where you put it; they don't like to move. Rare, slow growing, spectacular golden conifer to 2' tall and 15" wide in 10 years. 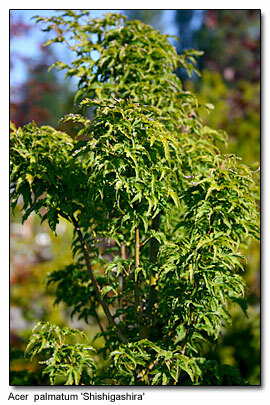 Stunning bluish green South African shrub to 10' tall and wide. The strongly divided leaves ooze tropicana. Plant this shrub 4 inches deeper than it comes out of the pot for increased hardiness, and cut back to the ground each spring. Who would think that a shrub from southern Australia would not only thrive, but even bloom through-out the winter in the PNW? Gray-green leaves serve as the perfect foil for the gazillions of bright orange-red, inch-and-a-half long trumpet flowers that keep the Anna hummingbirds fat, happy and in your garden all winter long. 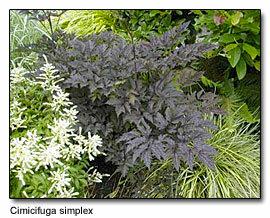 Recently renamed Actaea, its airy fern-like, dark red foliage to 5' tall is topped by fragrant purplish white flowers in fall. Likes moist, sunny location. Agave relative with 3' long spiky, but soft and spineless, blue-green leaves. In early summer a 6 foot tall, dark red flower spike arises to present you and your hummingbird friends with an irresistible display of green flowers with red and yellow bracts. It can live outdoors with dynamite drainage. You'll swear this perennial with its spiny, sapphire-blue flower bracts is a type of thistle, but this star of the sunny border is a member of the carrot family. Don't back into it when your weeding or you'll have a very uplifting experience. Very slow growth to 10 feet, with small, stiffly radiating fronds. Best specimens have blue leaves. Purportedly hardy to around 10 degrees in very well-drained soil. 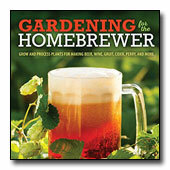 I grow mine in a pot and bring it into the garage during freezing weather. No other cycad can match this South African native for blue foliage. Nor can any other cycad, or most any other plant, match its ferociously sharp spines! It features a fat little trunk that can eventually reach 2 feet or more tall. 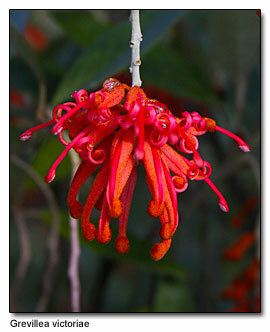 This plant is available through mail order but is incredibly rare and expensive. Grow this heavily armed beauty in a pot in cactus soil. Keep it in a window in an unheated garage during winter, and in full-sun in summer. Hope you don't have to transplant too often! Gardening expert, Ciscoe Morris delivers his high energy style on both tv (King 5 TV--Gardening with Ciscoe) and radio (NewsRadio 710--Gardening with Ciscoe), and writes for various local publications. Gardening with Ciscoe..
Bottom photograph courtesy of Lynne Thompson/Great Plant Picks.